I saw this recipe a few weeks ago and it totally piqued my interest, but I was a little skeptical of it. 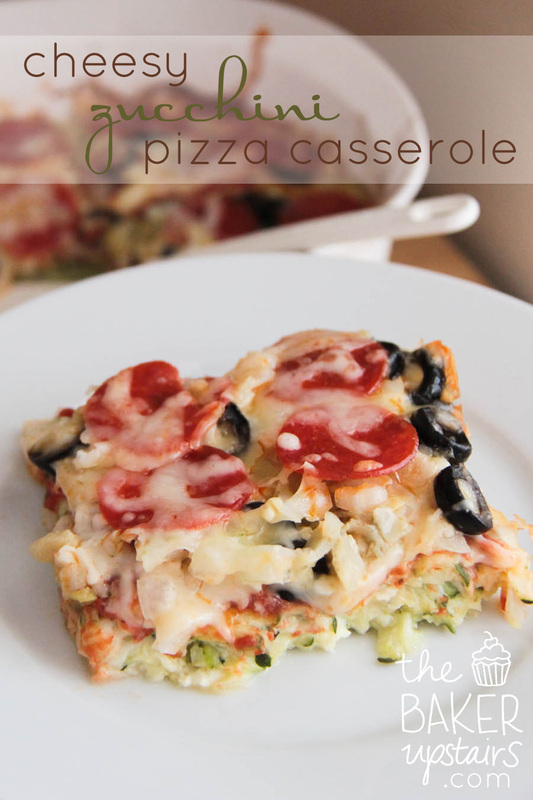 I mean... a zucchini crust topped with pizza toppings? It smelled amazing while it was baking, but it wasn't until I actually took my first bite that I was convinced. This recipe is a keeper! It's low carb, for those who are concerned about that (I'm certainly not), and has plenty of vegetables. At the same time, it's deliciously cheesy and gooey and pizza-y! We topped ours with homemade pizza sauce (using this recipe), chopped onions, artichoke hearts, olives, and pepperoni, and it was fantastic! I think the triumph of my day (or maybe week? year?) was that Abby ate her entire piece of casserole, vegetables and all. She even mumbled something about "yummy" while she was putting it into her mouth. If that's not the mark of a good recipe, then I don't know what is! any desired pizza toppings: pepperoni, sausage crumbles, olives, peppers, onions, etc. Preheat oven to 400 degrees. Spray 9×13 glass dish with non stick cooking spray and set aside. Grate zucchini and measure out 4 cups. Sprinkle salt over zucchini and let sit for 10 minutes. Ring out zucchini to remove any excess water and mix together with pepper, eggs, 1 cup mozzarella cheese, 1 cup cheddar cheese and parmesan cheese. Stir to combine and spread evenly into prepared baking dish. Bake 20 minutes. Remove from oven and top with pizza sauce, remaining cheeses and any desired pizza toppings. Bake 15 more minutes and remove. Cool 5 minutes before cutting and serving. yum!! this looks so good.